"5.4 earthquake rocks L.A. area"
The magnitude of the quake was originally set at 5.8. But Caltech officials downgraded it to 5.4 and said they doubted the temblor caused major structural damage. Kate Hutton, a staff seismologist at Caltech, said 11 aftershocks were recorded at various places, with 3.8 being the largest and the only one felt. O.K., a bit of overkill. This morning's tectonic rumba was a tad milder than the one Jeanette MacDonald, Clark Gable, and Fr Spencer Tracey re-enacted for us in 1936. I got everything cleaned up in 15 minutes and no one appears to be missing. But still exciting enough in its own way. 27 July - Bl Titus Brandsma, O. Carm. I missed mentioning Bl Titus Brandsma on his feast day last year -- the first time since The Inn began. In 2003 his feast day was also on a Sunday and wasn't celebrated liturgically. Here's what we had to say then. O almighty and everlasting God, Who in the abundance of Thy loving-kindness art wont to go beyond both the merits and prayers of Thy suppliant people, pour down upon us Thy mercy: that Thou mayest forgive us those things whereof our conscience is afraid, and grant us what our prayer does not dare to ask. Through our Lord Jesus Christ, Thy Son. Amen. Omnipotens sempiterne Deus, qui abundantia pietatis tuæ et merita supplicum excedis et vota: effunde super nos misericordiam tuam, ut dimittas quæ conscientia metuit, et adjicias quod oratio non præsumit. Per Dominum nostrum Iesum Christum Fillium tuum. Amen. Almighty and everlasting God who art always more ready to hear than we to pray, and art wont to give more than either we desire or deserve; Pour down upon us the abundance of thy mercy; forgiving us those things whereof our conscience is afraid, and giving us those good things which we are not worthy to ask, but through the merits and mediation of Jesus Christ, thy Son, our lord. Today is the old feast of St Anne, the mother of Our Lady. The Catholic Encyclopædia has an article on her here, although it has much more to say about the history of the feast day than it does about the woman. St Anne is the patroness of the old Celtic province of Brittany in France and the Province of Quebec in Canada, perhaps the most Catholic part of the new world at one time. Her shrine, St Anne de Beaupré, is still much visited. The shrine's own web page. O God, Who hast vouchsafed to bestow upon the Blessed Anne the grace by which she deserved to be made the mother of her who hath given birth to Thine only begotten Son; mercifully grant that we may win favour in Thy sight through the patronage of her whose feast we celebrate. Through the same, Our Lord. Amen. O God, Who didst deign to bestow such grace on blessed Anne that she was worthy to bear in her womb blessed Mary Thy Mother, grant us through the intercession of both mother and Child the abundance of Thy mercy; that as we devoutly and lovingly esteem their memory, we may, through their prayers, be worthy to come to the heavenly Jerusalem : Thou Who art God, living and reigning. Amen. This Guadalajara is in Spain rather than Mexico. These Saints, the Carmelite nuns Blessed María Pilar of St Francis Borgia, Blessed Teresa of the Child Jesus and St John of the Cross, and Blessed María Angeles of St Joseph were commemorated yesterday in the Carmelite calendar. They were martyred by the liberty-loving republicans of Spain in 1936. A short recounting of their martyrdom can be found here. This page gives the details of the canonization process and some pictures of the blesseds. You'll have to scroll down to find it; they're the last ones on the page. The first set has Ian Lowther playing a fine set on the Northumbrian small pipe, beginning and ending with "The Keel Row". And this is Jerry O'Sullivan giving us some jigs on the uillean pipe. There is some lovely use of the regulators in the second half. Both clips are of cauld wind pipes this week since the annual Piper's Gathering is coming up next weekend in Vermont. Alas, the budget doesn't run to any cross-country events for me. But if you happen to be in the area it would be a weekend well-spent. Details here. Well, it seems the teacher's aide in 11 year old Victoria's class went to visit a psychic the other day. We aren't told if we're dealing here with tarot cards, ouija boards, crystal balls, or just good old fashioned visions, but the psychic told the teacher's aide that her spooks informed her that a little girl in the aide's class who's name begins with "V" is being sexually abused by a man between the ages of 23 and 26. Teacher's aide dutifully reported this valuable information to the school authorities. And the school authorities laughed teacher's aide off campus? In your dreams. Why, of course, they tried to take the child from the parents. "For her own good", to be sure. You can read the outcome here. the blues in the night"
for the rest of the morning. That recording was played into shellac dust in our house when I was a boy. It introduced me to one of the smoothest voices that ever sang. But Mark has a better memory than I, or perhaps his parents merely had a larger record collection than mine. In any event, he came up with her biggest-selling recording and put it on his site here. "See the pyramids along the Nile. . . ."
St Laurence O'Toole Pipe Band playing their medley at this year's Cookstown competition. I missed posting yesterday and yesterday was a day for remembering martyrs. When July 14 rolled around Hilary reminded us here and here of the brutality of the French revolutionists. 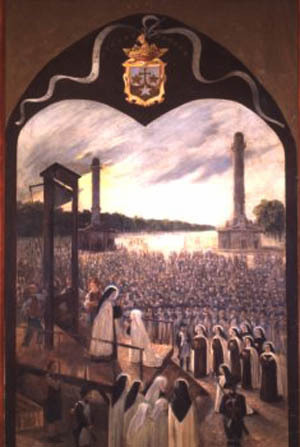 Three days later on July 17 the Church commemorates the martyrdom of the Carmelites of Compiegne at the hands of the same people. Here is a post on these martyrs from four years ago at The Inn. On the same day 124 years later (and 4 days after the final apparition of Our Lady at Fatima) the communist spiritual descendants of the French thugs savagely murdered the Russian Imperial family. The Russian Orthodox Church Outside Russia canonized Nicholas ("the Tsar Martyr") and the Imperial Family perhaps 20 years ago and the Russian Orthodox Church followed suit a few years later. This page, published by the ROC, gives an extensive hagiography of the family in that wonderfully florid Byzantine style. Today is the principal feastday of the Carmelite Order. Through the efforts of the crusader Berthold, a group of hermits living on Mount Carmel were organized into an Order after the traditional Western type about the year 1150. Oppressed by the Saracens, the monks slowly emigrated to Europe. During the night preceding the sixteenth of July, 1225, the Blessed Virgin is said to have commanded Pope Honorius III to approve the foundation (cf. fifth Lesson at Matins). 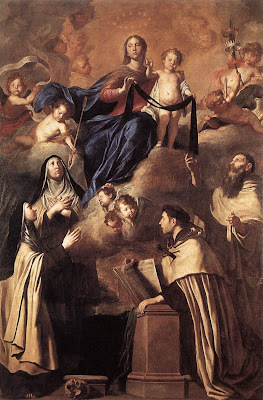 Since the Carmelites were still under constant harassment, the sixth General of the Order, St Simon Stock , pleaded with the Blessed Virgin for some special sign of her protection. On July 16, 1251, she designated the scapular as the special mark of her maternal love. That is why the present feast is also known as the feast of the Scapular. The Scapular, as part of the habit, is common to many religious Orders, but it is a special feature of the Carmelites. A smaller form of the scapular is given to lay persons in order that they may share in the great graces associated with it. Such a grace is the "Sabbatine privilege." In the so-called Bulla Sabbatina John XXII affirmed that wearers of the scapular are soon freed from the flames of purgatory, at least by the Saturday after death. The latest confirmation of the Bulla Sabbatina was promulgated by the Sacred Congregation of Indulgences, July 4, 1908. Application. The Blessed Virgin scapular should remind us that Christians have an apostolate against current extremes and extravagances in modes of dress. Clothes are a symbol of the person. Like the Christian heart, dress must be chaste and simple, for one judges the interior from the exterior. It should not be necessary to add that special attention be given this matter when preparing for church attendance. 2. Holy Mass (Gaudeamus). In part the Mass is from the Common, in part it is composed of proper texts. We begin with a joyful shout. We are celebrating a feast in Mary's honor; yes, even the angels in heaven are taking note (Introit); and the Church adds her finest nuptial hymn, Psalm 44. The priest enters, clad in festal robes, a type of the heavenly bride going to her divine nuptials (this very common Introit originated in the Greek liturgy). In the Lesson Mary stands before us as our instructor and describes her office of protectress: "I am the mother of fair love, of fear, of knowledge, and of holy hope. . . . .Come to me, all of you, and be filled with my fruits." the Gospel is the well-known passage from the Marian Masses in which Christ praises His Mother as blessed and includes all those who mother God spiritually through hearing and keeping His word. By way of exception, the Offertory and Communion are petition prayers composed by the Church. Let those who have a Little Office of the Blessed Virgin pray it as part of today's liturgy. "Once on safari in Africa, we lost our corkscrew and had to survive for many days on food and water." George Will explains to us this morning that W. C. Fields's alleged African experience was even more harrowing than he knew. 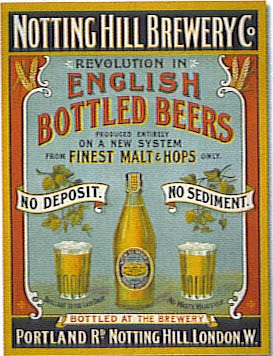 Beer, we learn here, is the backbone, the fons et origo, of civilization, the ultimate health food. Closely followed by wine. It has been pointed out to me that I am remiss in merely mentioning the recent New Yorker article and not providing a defence. Well, to be sure, I don't believe the accusations for a moment. I am indeed a worshiper at the throne of the formidable G.K., whose sentences - and ideas - are as finely wrought as any in the language. But a proper defence requires access to all the sources cited and I lack a good many. Dale Ahlquist's response via Video meliora, etc. You'll have to scroll down a bit for the relevant text. And some comments posted at The Blog of the American Chesterton Society. A wonderful, not to say brilliant, new product. "Even though this product contains 50% less Bugnini than the original, some traditionalists may still be allergic." Alas. . . . . There was a pointed letter in The Times this morning. Unusual for The Times, which is accustomed to publishing only the hurt bleatings of the sensitive left. It seems someone named Penn Jillette recently claimed not to understand global warming or whether it was a real phenomenon. Ever since he's been dodging bricks, stones, and rotten tomatoes from the unco guid. This morning's letter-writer pointed out that what Mr Jillette really failed to understand is that global warming, which had started out as a theory and become a political movement, was now a religion. Poor Mr Jillette. He didn't realize he was in the middle of a revival meeting when he stood up and claimed to be an agnostic. I can't find an online location for the letters section of The Times. It's probably there but my research talents don't appear to be up to the task of finding it. If you want to try you can start here. They have their own website here. It must be the three-day weekend. The Times had a front page with several really good reads this morning. This one titled A workaday road that cuts through California's back story may only be of interest if you've driven the length of the state and taken one of more of the roads less travelled. It is indeed hotter than the hinges of hell and as bleak as the author states but for some reason still beautiful in its own way. This one is datelined Harare. I wouldn't have thought anything worse could be reported about Mugabe's Zimbabwe than the reports of the last few years. But apparently, I still underestimate. And finally, the ingrained American, loner, do-it-yourself part of me finds a good deal of sympathy for these fellows. Well, not the news precisely. But at least the New Yorker. 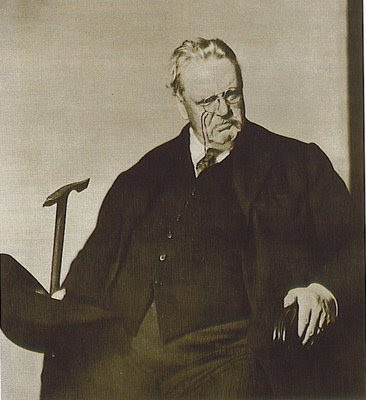 Adam Gopnik has an interesting piece on G.K. Chesterton in this week's edition. It ranges between high praise (The Man Who Was Thursday is . . ."one of the hidden hinges of twentieth century writing. . .") to accusations of anti-Semitism. It doesn't appear in the online edition. So if you're interested you'll have to try the library or the newstand. And it does contain a nice exposition of "The Man Who Was Thursday" and the original of the picture above. You can click on the picture above and get a better view. It's not National-Geographic-worthy but it'll give you a hint. Last night's fireworks show itself was a treat. As was the dinner, the Guinness, and the hospitality in general. It's the photography that's wanting. The thing about shooting fireworks is that I can only tell if a display is worth shooting after it's too late. And I got in a few tunes. "Yankee Doodle" and "The Marine's Hymn" were appropriate to the occasion but after that the mind wandered and tunes came at random. "Lord Huntley's Cave", "Drummond Castle Laundry", and "Queen Victoria's Diamond Jubilee" are great tunes but that last is perhaps contraindicated at the great republican fest of July 4th. St Modwenna was an Irish nun of the 9th century who cured the son of King Ethelwolfe of Mercia of a disease that was then thought incurable. "When her monastrie was destroyed in Ireland [probably in the Norse invasions] Modwena came over into England unto whom King Ethelwolfe gave leave to build two abbies and also delivered unto her his sister Edith to be a professed nun." So says Mrs. D'Arcy quoting O'Hanlon's Lives of the Irish Saints. She is said to have built several monasteries in both England and Scotland. But the one in Polesworth lasted until the 16th century when Henry VIII, the archetype of the Labour Party, nationalised all the abbeys of England. Polesworth Abbey still functions as a parish church of the Church of England. Modwenna ended her days as a hermit on a small island called Andressey, named after St Andrew. She was buried there and her shrine became a place for many miracles. Her relics were at one time transferred to a church in Burton-on-Trent but I can find no indication of which church or whether their location survived the furies of the Reformation. . . .it says here. I rather think, though, they may have that the wrong way round. In my considered opinion it is dementia that causes the eating of tofu. They had run completely out. . . .
. . .by the time I got in the line for technical ability. This computer has been up and down for several days lately. I was trying to set up a wireless network by myself. We can pause here for those of you who know me to stop laughing. There have been uncounted hours worth of fiddling with codes, researching settings, trying to use the "Chat Help" feature that Earthlink makes one use, and repeating myself over and over on the telephone support line. On the plus side, I am acquiring a fairly good facility with the various accents of the Indian subcontinent. And no doubt the Indian gentlemen are wondering about the nasal southern Californian with the slight tinge of South Carolinian drawl and the Anglo Irish vocabulary. No man likes to do it, but in the end I surrendered and called someone to come out who knew what he was doing. He took one look at my set up and said "That adapter is only for a wired network." So I could have entered codes for the rest of my life and even learnt Hindustani and what I had set up would never have worked. The man who knew what he was doing sorted it out in under ten minutes. It took him longer to write out the bill than it did to set up the network. So if you need technical assistance, you know where not to go. And my thumb is feeling much better now, thank you. I can bash away at the space bar without a twinge. July 4th is also the feast of the martyrs of Chideock Castle. Blessed Fr John Cornelius, S.J. (whose surname was probably O'Mahoney) and three lay companions, Blesseds Patrick Salmon, John Carey, and Thomas Bosgrave, were executed this day in Dorchester for their Catholic faith. Salmon and Carey were actually Dublin men and Fr Cornelius was born of Irish parents. There is more about them here. as it used to be known, is here again. It is occasionally remembered as the almost anniversary (it was actually July 2d, so they tell me) of the signing of the Declaration of Independence. But here in the Athens of Los Angeles County it is largely an occasion for setting off explosions and safe-and-sane (sic) incendiary devices. We take "bombs bursting in air" and "the rockets red glare" quite seriously in this corner of the Republic. This year we will be at a gathering elsewhere and will miss the local festivities. But we won't be without pyrotechnics. 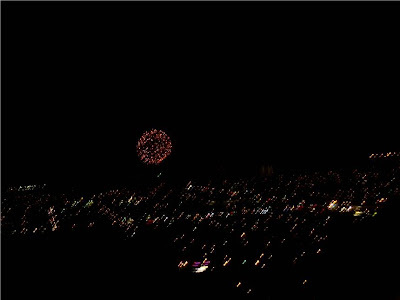 The hostess has a condo at the top of Signal Hill with a wonderful view of the fireworks display at the Queen Mary a few miles away in the harbor. There is also a balcony suitable for the playing of patriotic anthems on the Great Highland Bagpipe. If the local frenzy of patriotic arson spares us in our absence, it should be a very jolly Fourth. And we wish you a happy one, too.